Update March 13, 2013 – if you like this post, I also recommend reading my post, How to Destroy America in Ten Easy Steps. The fact is, the entire housing bubble and the economic collapse were caused entirely by our own Federal Government. People are blaming capitalism but we no longer have capitalism, we have CRONY-capitalism, aka Corporate Fascism, where the government bails out the banks and corporations while the banks and corporations do the bidding of the government for favors, protection from domestic and foreign competition and bailout money. This is NOT capitalism. Capitalism requires a free-market without government intervention. If we had real capitalism, the housing bubble and the recession would not have happened. If we had capitalism, corporations would not be able to use Government rules, regulation and taxation to make sure their competition cannot survive. Without competition, corporations are able to create monopolies, control prices and limit your choices, and they partner with government to that end. Government is happy to oblige in exchange for their obedience, campaign finance contributions and not interfering in Big Government and its expansion. It is competition, from capitalism, which prevents corrupted corporations, and Government, from existing. Do not blame capitalism, blame your Government for removing capitalism. I’m not excusing Wall Street and the Banks from blame. I’m saying that our own Government sent out the invites, provided the drugs and booze, and everyone else just showed up for the party. If the government had stayed out of the private sector, and not created the incentive and the opportunity for businesses to run wild, it would not have happened. Have you ever heard the Government admit that it made a mistake? Think about that for a second. I never have. Is it possible it’s never made a mistake? No, that’s not possible, which means either their decisions that created this economic collapse were intentional or they have no idea what they are doing and won’t admit it. Both of those possibilities are frightening. The following timeline of events is the truth that caused the economic collapse. While I begin this with the Community Reinvestment Act, there is a long list of government failures and bad government incentives that led to the destruction of the economy through government distorting and manipulating free-market capitalism. And the genius of this plan? The Government and their media pundits and Hollywood allies turn around and blame capitalism for creating the entire mess, when in fact we have not been practicing capitalism for decades. And what does demonizing capitalism produce? Movements like Occupy Wall Street that want to bring down capitalism and raise the flag of socialism, turning to the Government for the answer to all their problems while never realizing that capitalism is dead, and Government is what killed it, and created this nightmare we live in. I apologize that the list is long, but this is the smallest nutshell I could make it and still give you enough details to see what happened. Items in red are highlighting major government distortions and destruction of true free market Capitalism. First, our Government passes the Community Reinvestment Act of 1977 in an effort to assist low-income individuals to buy homes. The CRA of 1977 simply “encourages” banks to make a certain amount of loans to low-income individuals. No enforcement or penalty for not being “encouraged”…yet. In the mid 1990’s the HUD department of the Government begins requiring banks to prove they are making the right number of low-income loans. Banks not making the government imposed, and now enforced “quota,” are penalized. The Clinton and Bush administrations with Barney Frank and Chris Dodd use the Community Reinvestment Act of 1977 to force banks to make loans to unqualified people in the name of making homes affordable to everyone. This guarantees votes for the politicians. They ignore the likely economic outcome of giving loans to people who can’t pay them back. If the banks don’t make the loans to unqualified borrowers, our Government prevents banks from opening new branches, new ATM’s or expanding. Every bank knows if they don’t accept the invite to the Government party and start giving out loans to people who can’t pay them back, some bank will….which will force other banks out of business as the bank willing to play this game gets to expand and take market share from the other banks, who are denied by our Government every application to expand. At the same time, both Republican and Democrat politicians in Washington and the bankers of The Fed attempt to manipulate the economy by lowering interest rates to boost economic growth. Low interest rates reduce the costs of borrowing money which increases the number of home loans created, increasing the number of homes bought, thus reducing home inventory which raises prices. As prices slowly rise, politicians continue to pander for votes by promising the American Dream and that owning a home is the right of every American. To backup that statement, they put the American taxpayer on the hook for every loan processed through Fannie Mae and Freddie Mac. As home prices rise, Fannie and Freddie, at the time both implied government entities (now explicit ones backed by taxpayer dollars) begin buying mortgages from the banks. Between 1998 and 2003 Fannie & Freddie were the most frequent buyers of home loans. Unqualified borrowers (low-income, bad credit, no down-payment) are suddenly made “qualified” by banks being blackmailed by our own government. Banks finally get the message that the government doesn’t care how risky the loan is or how unlikely the borrower is to pay it back, so they learn to continue making home loans, no matter how risky, and just sell them off to Fannie and Freddie as fast as possible. By the time Countrywide was out of business, 90% of their loans had been sold to Fannie & Freddie. Fannie & Freddie have barely $83B in assets to cover a potential whopping loss of $5T in liabilities, an astounding and unheard of 60 to 1 ratio. Nobody in Washington cares because they know the taxpayer will foot the bill of all losses. As these “unqualified” borrowers flood the market overnight buying houses, a rapid decrease in housing inventory begins inflating prices beyond normal ranges. Basic supply and demand principle. Builders rush in and begin building homes but panic sets in as buyers continue to flood the market for fear of being “priced out forever.” The National Association of Realtors (NAR) perpetuates this fear in the media to make more money through Realtor sales commissions. Speculators enter the market, flipping homes for profit further driving supply down to ridiculously low levels which, through supply and demand, pushes prices even further into the stratosphere. Buyers that would have been qualified at “normal” prices become unqualified as prices go out of even their range, fear sets in for them too so they begin using the same creative financing the banks were giving the original unqualified buyers to become qualified. Wall Street creates investment vehicles that buy these unqualified mortgages from banks, mixes them together in pools of investments and resells them. Normally, banks would be concerned that defaults from unqualified borrowers buying homes would cause the bank to fail. By selling these unqualified loans to Wall Street, the banks no longer have this fear. Imagine being able to drink as much alcohol as you want and never getting sick. Now that the banks can unload every mortgage, toxic or not, onto Wall Street (to be bailed out eventually by the taxpayer) or the taxpayer directly (through Fannie and Freddie), they go on a drinking binge of epic proportions, with no fear of a hangover. 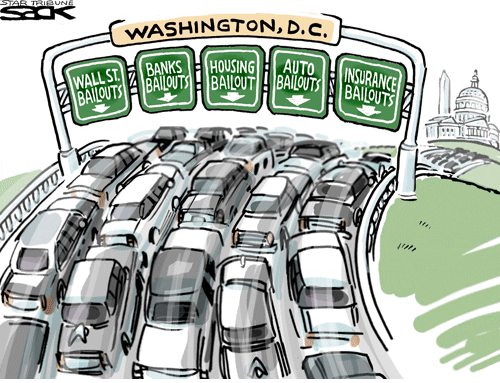 Banks enjoy all the fees they can charge for each loan they process and sell off to Wall Street or Fannie and Freddie. Banks accelerate loan processing to maximize fee revenue. The Party rages on into the early morning hours…fraud permeates marketplace. Fraud from buyers, from banks, from Wall Street, from rating agencies, from Fannie & Freddie, from our Government. There are no longer any “unqualified” buyers. Everyone can buy a house, even if they don’t have a job, or any money. Homeowners across the country see the rise in “value” of their own home and begin extracting that money from their home like an ATM machine buying cars, flat screens, iPods and taking vacations all over the world. Our Government and The Fed see what is happening, but the economy is booming, money is flowing, the party is rocking…voters are exuberant…so the Government does nothing to stop the inevitable catastrophe. They know they can just point fingers at the Banks and Wall Street leveraging that ancient tactic of turning the masses against the “rich” which works like a charm every single time. Home prices reach an unsustainable peak, the collapse begins. The original unqualified borrowers begin defaulting on their mortgages and stop paying. The Wall Street investment vehicles begin collapsing as borrowers default and a sudden and rapid exit from housing related investments occurs. As the Wall Street investments collapse and more and more borrowers default, housing prices begin to plummet. The unqualified “qualified” borrowers begin defaulting too. Banks that were contractually liable for mortgage defaults they sold to Wall Street for 30 days begin to fail as Wall Street pushes those mortgages back on the banks. Banks begin collapsing. As homeowners begin to owe more than the house is worth, some abandon it while others squat in their house, never paying a mortgage as banks take years to complete the foreclosure process. Fear sets in, the economy begins collapsing, unemployment begins to rise. The Government, the same one that brought this entire mess to us, prints trillions of dollars in an attempt to bail out Wall Street and the Banks for what was ultimately our own Governments fault. The Government, in attempt to artificially prop up prices and keep the housing bubble inflated offers home-buyer incentives and tax breaks. The Government, in attempt to artificially prop up prices and rescue Fannie & Freddie, assumes control of both and prints billions of dollars to bail them out, all at taxpayer expense. The Banks, in an attempt to artificially prop up prices and keep the housing bubble inflated keep the majority of homes in foreclosure off the market so the number of homes available is reduced. Basic supply and demand. The Government, to protect the banks from failing, suspends the “Mark-To-Market” rule in Accounting, only for banks, allowing them to keep housing assets on their books at the inflated “bubble” value. If they had to do what all other companies do and re-value their assets (homes in this case) to current market values, most of them would not be able to cover the loss (the write-down) and would go bankrupt. As home prices are artificially kept too high, and banks are now responsible for defaulting mortgages (just like in the old days), nobody qualifies to buy a home through a bank. Banks stop loaning. The Government, steps in and now does 90% of mortgage loans through the FHA thereby continuing its efforts to keep home prices artificially inflated. They used to do only 3% of home loans. American taxpayer now directly on the hook for any future mortgage defaults. The Government, (the Democrats, liberal Republicans and Barney Frank-the hosts of the Government Party) blame Wall Street and Banks for the whole thing. The Government, hands the responsible taxpayer the bill for the party. Americans attack banks and corporate America as the culprit. The government supports this to keep attention away from the fact that they are the source of the problem. People call for the destruction of “Capitalism” not realizing that the problem is not capitalism. The solution is capitalism. Capitalism means that government does NOT get involved in the free market economy. But when the Government got involved in buying bad mortgages, lowering standards and bailing out the banks that bought these loans…capitalism was annihilated. What was created was CRONY-capitalism where the government bails out the corporations and the corporations do the bidding of the government for favors and protection. America as we knew it, dies. Please see attached file by clicking here and found at this website for information on how the Federal government was controlling the expansion of banks if they were not meeting their Community Reinvestment Act of 1977 quotas. Article is from 2001. Excerpt below from Section 4: Enforcement. 4. The federal banking agencies enforce the CRA by examining the CRA record of a bank, issuing a written report with a rating, and taking the banks CRA record into account when considering the banks application to expand its business. As part of their regulatory function, the federal banking agencies periodically send examiners to a bank to determine whether it is in compliance with the banking laws, including the CRA. At the end of the CRA examination, the agency issues a written report describing its findings and containing one of four ratings: outstanding record of meeting community credit needs; satisfactory record; needs to improve; and substantial non-compliance. In addition to these periodic examinations, the federal banking agencies also evaluate certain bank expansion applications to ensure that the bank is capable of expanding and qualified to do so. One of the issues the agencies consider when a bank applies to expand its business is the banks CRA record. An agency may deny an application if a bank has a poor CRA record or condition approval on improved performance. The post itself was written by myself based initially on the books, articles and analysis of economist Thomas Sowell, a Senior Fellow at the Hoover Institution of Stanford University in Stanford, California who wrote The Housing Boom and Bust, and Congressman Dr. Ron Paul who has been a distinguished counselor to the Ludwig von Mises Institute, and is widely quoted by scholars and writers in the fields of monetary policy, banking, and political economy. Ron Paul’s book, End the Fed discusses the causes of the bubble, including the Community Reinvestment Act of 1977. Another source for this post was Peter Schiff, the President of EuroPacific Capital and the author of Crashproof which described the housing bubble and predicted its collapse as well as the economic recession to follow, years before it happened. Lastly, five years of my own personal research on economics, economies, politics, political history and monetary and fiscal policy. In all the research and reading I have done in the past five years, I have found nothing to contradict any of the events in the timeline as I’ve outlined it, and have instead found many instances that corroborate the events. The names above are linked to Thomas Sowell’s and Ron Paul’s websites and Peter Schiff’s video blog, respectively. Also, if you Google “Peter Schiff was right” or click here, you can see the many times he was laughed at on MSNBC and other media outlets for his predictions of what would happen, which of course, did happen. Lastly, I have read, and would recommend any of the books along the left side margin under “Powerful Books.” I make nothing from recommending these books. I have been an amateur armchair economist studying how economies grow and collapse since 2005 when the housing bubble really started taking off and I knew something was wrong, but I didn’t know what. I also knew that I didn’t know enough about it and my self-education on the subject began. Since then I have personally read each of those books. I’m sharing them, and this blog, so anyone else who wants to learn more about what is going on has a starting point. The question many minds have been pondering for quite awhile now is just what happened to our great economy? While quite easy to explain, it will be much harder to get back on track. There are several factors, which alone would never sink the economy alone, but together they become a different story. Short version? Greed and stupidity. Our Major companies are run by computer programs that play monopoly with our houses. The rest of the story…. #2 Over inflated housing market. Big investors blinded by greed and run by computers poured billions of dollars, into over inflated housing markets. You need not be a rocket scientist to figure out that in a market like southern California when housing prices rise 400% in a few short years that the bottom will dropout, but a computer doesn’t understand the concept of something that is too good to be true. So of course when did drop out, the computers didn’t see it coming, and those holding the paper took the beating. #3 Credit card economy. Sometime late in the twentieth century, it occurred to some economists that you could spur economic growth by selling things on credit. So somehow it got to the point in the 1990’s where you could get credit cards for your kids, your dog, companies that don’t really exist. In the end, at 25% interest is like paying double for everything you charge, and at some point in debt far enough that it will take forever to pay it back. #4 International investment drain. Dubai Launched a huge growth in the luxury housing market, one that could only be afforded by millionaires. This adventure attracted a large portion of the international investment funds and in the long run will be doomed because there isn’t enough Millionaires world wide to buy up all this property. Even so the greed factor has sent billions of dollars off to Dubai where no one lives, pulling that money from real projects that would help promote the global economy. #5 Which leaves just one more little problem, Gas and Oil companies. Exxon Mobile has posted record profits of over 8 billion dollars a quarter every quarter since the beginning of the recession. How did the oil companies make so much money while the economy falls apart? Easy they caused it, while peoples paychecks were shrinking they raised prices of gas to record levels blaming foriegn oil suppliers. Near half of the oil used in this country is produced in this country, they gave no raises, had no production cost increases, yet raised the price of gas 200%. Notwithstanding, billions of gallons of gas held in reserve, which was purchased and produced at lower rates. Their excuse a perversion of supply and demand, if you use more we must charge more and oil costs abroad. Transportation of goods is a major cost factor, by raising gas prices, so high they pushed the cost of all consumer goods and products, at every single point in the supply chain. Thereby creating the largest driving force in the collapse of our economy and made a trillion dollars in doing so. A small fuss was raised, yet in the end nothing was done about this gross rip off of the American peoples. Why? Because the oil companies own Congress. What can be done? So what happens when a country or a world puts too many eggs in one economic basket? The basket either overflows, or tips over and in the end, you have a mess to clean up. 2. Agree – But I put most of the blame on our Government. Had Clinton and Bush not used the HUD to give the CRA of 1977 teeth and terrorize the banks into loaning to those they knew could not pay it back, and THEN provide a way for the banks to unload that risk to the taxpayer by selling the loans to the government through the FHA, the banks would not have made those risky loans on their own. It took our Government first to force the banks to make those loans, “or else” and then provide them a means to unload the risk. If the option to run up these home prices had existed before, why had the banks not done it before? Because the games our Government played to create “affordable” housing only started recently with the drum beat of Barney Frank, Clinton supporting it and Bush continuing it. So, as much as the banks and Wall Street were part of the problem, our Government is to blame for opening the door, in the name of “affordability” which like most Government programs and Political “good ideas” create the exact opposite. 3. Agree. More to it, but yes. 4. I don’t know enough about this to comment. I know Dubai went on a massive building spree and overbuilt, much like most of the world and I agree that it was malinvestment, much like most of the world, which diverted limited resources away from higher value projects to lower value ones because money was too cheap from low interest rates, but how much of what went on in Dubai specifically affected us, I don’t know. 5. Disagree. I’ve been doing research for a post I will do on the Oil Companies soon, but in a nutshell, oil is a commodity like air and water. It’s pretty much the same regardless of where you get it. Without specialization, there is no way to raise the price. Oil is sold on the world market, so all countries show up to the marketplace with their oil and everybody buys from whoever is cheaper. It’s like going to the Farmer’s Market and there are a dozen farmers all selling fresh tomatoes. All you care about is who is selling it cheaper. And since all oil is bought and sold in USD because we are the reserve currency, the exchange rate is not a factor (India and China aside that have recently started trading oil in gold because they hate using our garbage USD). Since America is the 4th largest oil producing country and Exxon is the 16th largest producing oil company, they don’t have enough weight in the market to manipulate the price of oil. In fact the top three oil producing countries produce 4X more oil than we do and when you look at Exxon’s production volume against the top 15 oil producing companies, it’s almost insignificant. So the farmer with the 16th largest farm in the county raising his tomato prices at the farmers market, is just going to drive everyone over to the tents of the other 15 farmers. Then if you look at how much it costs to create just ONE oil rig, $3B+, and all the R&D expenses that go into new drilling and platform technologies, the oil companies have large profits in absolute dollar terms but when you consider what it costs to drill for oil, it’s really not that much, since most of it gets plowed back into platforms, R&D and all their associated overhead. Add to that the fact that their profits range only between 6% and 11% of their revenues, I don’t think that is sufficient profit to condemn them. Even at 25% or more I’d have a hard time caring about it. I want them to make profits so they can drill for more oil, create newer and cleaner ways to do it, all so we can be less dependent on foreign oil. We should be applauding them for higher profits, not condemning them. As for the price of gas, we can blame that on The Fed, since their suppression of interest rates is inflating the dollar, which inflates the cost of everything, cereal, Big Macs, carpet cleaner, and gas, just like everything else. I do agree that we have Corporatism, where Corporations are in bed with the Politicians, trading support for various politicians in various ways (donations, stock-tips, news coverage, etc…) in exchange for favors (protectionism, reduced regulation, etc…). But again, that blame rests entirely at the feet of our own Government. It is our Government that accepts the bribes and exchanges them for protection. If the Government stopped being corrupt, the Corporations would have nowhere to turn to for the protection and would have to compete with each other in an open and fair-market playing field. The company that does NOT play this game, will quickly find themselves losing market share and eventually going out of business. So who is to blame for the accident if a parent gives their drunk teen the car keys? The teen for driving drunk or the parent for giving them the keys? Our Corporatism is no different, where Government dangles the keys in front of our Corporations, and they grab them before someone else does. The only difference is that there are a lot of keys up for grabs so all of our economic “accidents” start with BIG GOVERNMENT and all their keys. My finance professor decided that today he would teach us about all of the things that happened that led us to this “great recession” and economic collapse. He went a little bit more in depth in regards to credit ratings and securities, but everything you said is 100% accurate in regards to the lecture today. I enjoyed reading it. Good work. The Gramm–Leach–Bliley Act allowed deposit banks to become investment banks. This totally cancelled the protections we have had since the 30s from the Glass Steagall act. An excellent book that describes the details of how the banks and investment houses raped our 401Ks they made fortunes and we citizens must refill their coffers. Thanks for the comment and the book recommendation. I will definitely take a look at it.